The recent cyber-attack and holding hostage of a South African insurance provider’s IT infrastructure has drawn attention to the dire need for effective protection of consumer data. While the company asserts that no financial losses have been encountered by any of its policy holders, it cannot currently confirm the volume of data and number of individuals that have been affected by this data breach. Any organisation that handles consumer information will be significantly impacted by the introduction of data protection legislation. The Protection of Personal Information Act (POPI), which is expected to come into effect in 2018, prescribes how personal information may be stored, transferred and destroyed. Companies need to prioritise the enhancement of data security, the updating of vendor contracts and safeguarding trans-border flow of information. Entities will need to appoint an Information Officer and gain an understanding of the duties of the responsible party and the rights of the data subject, including how to be prepared and manage a data breach. The Information Regulator has been established and the draft regulations for POPIA published. Following the implementation of the Act, a grace period allows companies the necessary time to ensure that their systems are compliant and meet the requirements. 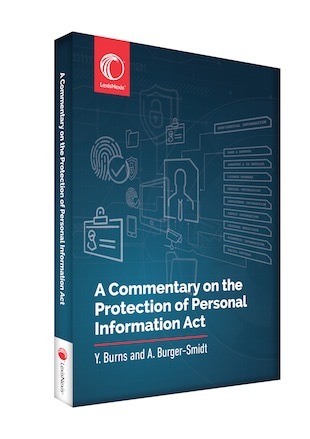 Last said the newly released book, A Commentary on the Protection of Personal Information Act, examines the eight conditions of lawful processing, the difference between personal and special personal information and the exemptions, exceptions and exclusions as set out in the Act. The authors set out the powers of the Information Regulator and possible fines, compensation and damages and cover the impact of the POPI Act on several important issues including employment law; non-automated and automated decision-making; outsourcing of processing; marketing and direct marketing; credit reporting and the Internet. POPI will bring South Africa in line with international data protection standards. It is widely accepted that the European Union has been at the forefront of the development of the framework for the protection of personal information. It is for this reason that the authors of A Commentary on the Protection of Personal Information Act have relied extensively on the General Data Protection Regulation (GDPR) to provide guidance on how POPI is likely to be implemented. A Commentary on the Protection of Personal Information Act retails for R500.00 excluding VAT and delivery and will be available for sale from 5 July 2018 from the LexisNexis online store. With a BJuris LLD from the University of South Africa (UNISA), Yvonne Burns was a Professor in the School of Law at UNISA for 30 years. Burns has published numerous textbooks with focus areas including Administrative Law and Communications Law. Ahmore Burger-Smidt is a Director at Werksmans Attorneys and holds a BCom and LLB from the University of North West and a Master’s in Business Leadership Degree from the University of South Africa (UNISA). As a member of the International Association of Data Privacy Professionals, Burger-Smidt and has been advising clients on data privacy across a broad base of industries and sectors for many years. She has contributed to numerous publications and regularly lectures on data privacy legislation.